- Publisher These studies on a variety of biblical texts focus deftly on reading, listening to, and proclaiming the gospel in a broken, fragmented, and "post-Christendom" world. Brueggemann explores how these traditions have the potential to continually resonate in our contemporary communities and individual lives. - Publisher The leading Old Testament theologian reflects on the meaning of the gospel in today's world.These studies on a variety of biblical texts focus deftly on reading, listening to, and proclaiming the gospel in a broken, fragmented, and "post-Christendom" world. Brueggemann explores how these traditions have the potential to continually resonate in our contemporary communities and individual lives. 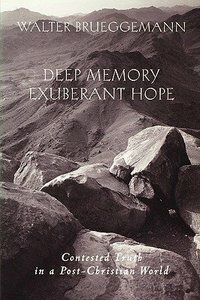 About "Deep Memory, Exuberant Hope"
These studies on a variety of biblical texts focus deftly on reading, listening to, and proclaiming the gospel in a broken, fragmented, and "post-Christendom" world. Brueggemann explores how these traditions have the potential to continually resonate in our contemporary communities and individual lives. The leading Old Testament theologian reflects on the meaning of the gospel in today's world.These studies on a variety of biblical texts focus deftly on reading, listening to, and proclaiming the gospel in a broken, fragmented, and "post-Christendom" world. Brueggemann explores how these traditions have the potential to continually resonate in our contemporary communities and individual lives.